Pure organic honey is an amazing health food with many health benefits. It provides energy for the liver and brain, reduces metabolic stress, is an effective cough suppressant, improves digestion and reduces many gastrointestinal disorders, improves and restores the immune system, lowers cholesterol and triglycerides and increases HDL-cholesterol, is an effective antioxidant, reduces affects of aging and the risks for some forms of cancer, helps treat diabetic ulcers, speeds healing of first and second degree burns, and even helps reduce gum and periodontal disease. If you have a loved one down with the flu or with a sore throat surprised them with a thoughtful get well kit. 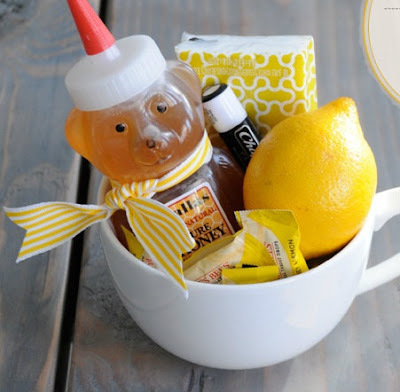 Grab a cup and filled it with essentials like tea bags, chapstick, tissues, cough drops, fresh lemon and pure organic honey. Wrap in cellophane and print a get well card, for a personalized touch. Is the little things like these that people truly appreciate and will always remember you the most.